Decembers are a blur whether or not it’s snowing. With no plans to host, I’ve decided to spend the holiday party season as a kind of foreign exchange student. I’m just showing up when asked and however they’re celebrating, I’ll just go with it. Last Christmas was my family’s turn to have Noche Buena dinner and before that I had a party for friends before everyone went their separate ways, so it’s just not my year. I’ll also be going home earlier than usual so setting my iTunes to Christmas is the only decorating I’ve done. They’ve been running on a loop since Thanksgiving, and I could stop them at any time but have no plans to until the first week of January. Which isn’t to say that I’ll be irony free until then. For every Muppets: A Christmas Together, there’s Stephen Colbert or A John Waters Christmas (which features a track by a creature named Little Cindy that is so terrifying, it belongs in a Halloween collection). They all get equal play time. My holiday cooking has been mostly things that I can heat quickly when I get home late or gifts to bring friends from my Brooklyn homeland in exchange for their hospitality. It was with that thought that I finally made Albóndigas al Chipotle. I’d bought the ingredients a few weeks ago but took my time making them, the enormous can of fire-roasted tomatoes looking fat and hopeful every time I passed it over in the pantry. Though the timing was coincidental, I took the mix of hot reds and green mint as a sign that even this year I was getting the little bit of Christmas I needed right that very minute. Adapted from Rick Bayless’ Mexican Everyday. 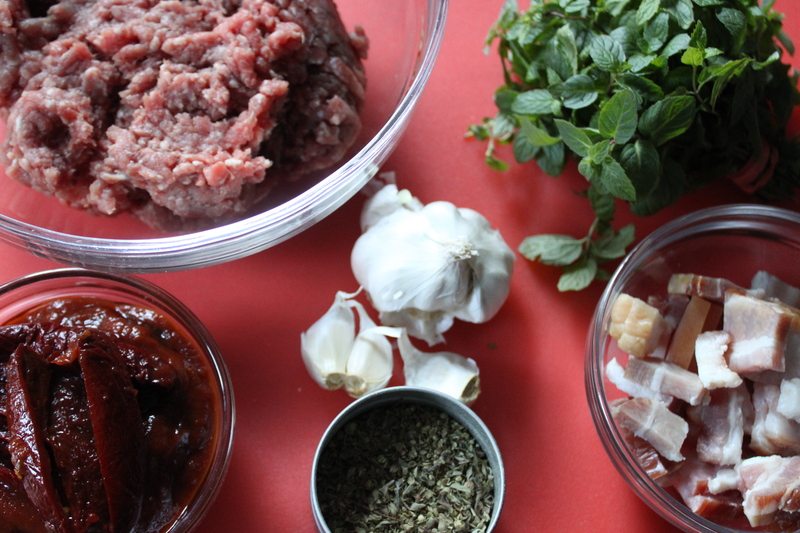 Though the original recipe called for all ground pork, all beef, any combination of pork and beef works as well. They’re baked and not fried but ground turkey would be an even leaner option. Serve with Mexican crema in tapas portions as an appetizer. In a food processor, combine bacon and 1 garlic clove. Process until finely chopped. Add eggs, bread crumbs and 1 teaspoon salt. Pulse several times to combine thoroughly, then add pork, beef and mint. Pulse a few more times until well combined but not a paste. Remove meat from processor. 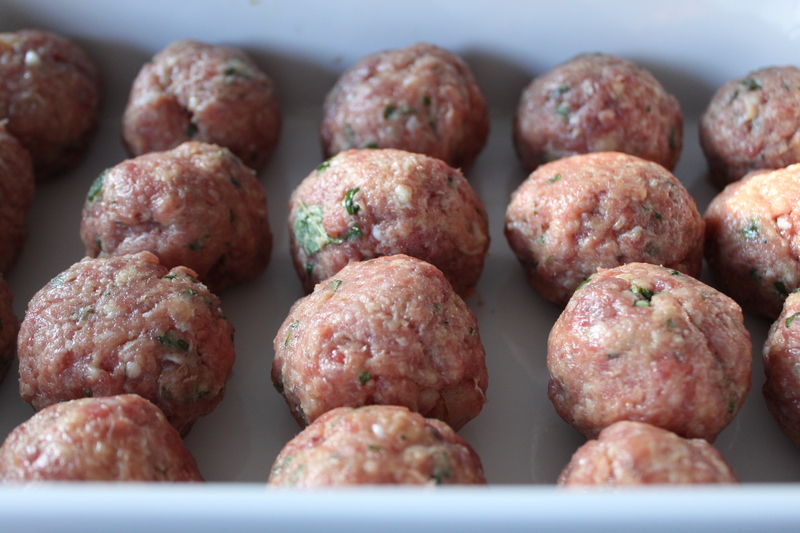 With wet hands, form meat into about 20-24 plum-size balls and space them out in a 13-by-9-inch baking dish. Bake until lightly browned, about 15 minutes. While meatballs bake, combine tomatoes, 1 to 2 tablespoons chipotle sauce, oregano, remaining garlic cloves (cut in half) and 1/2 teaspoon salt in a blender or food processor. Process to a smooth purée. Divide meatballs among serving plates, leaving sauce behind. Combine sauce and broth in a saucepan and simmer until slightly reduced, about 5 minutes. Adjust seasonings to taste. 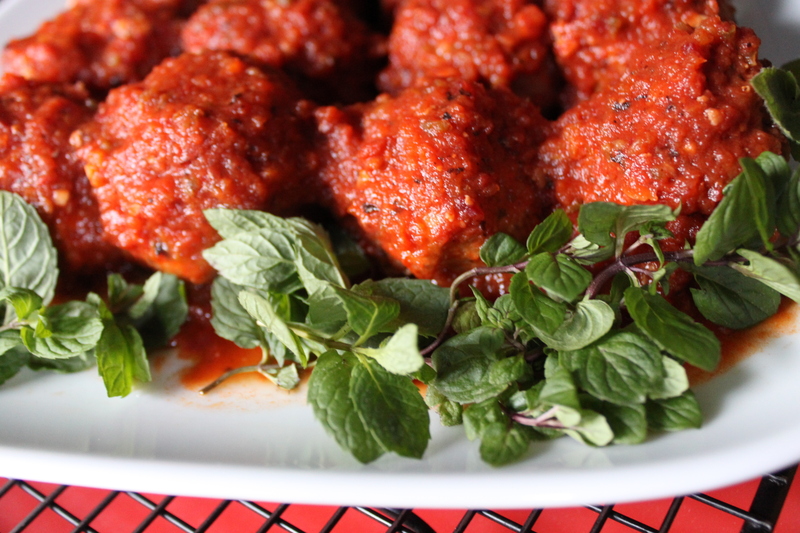 Spoon sauce over meatballs, decorate with extra mint leaves and serve. Note – Online version of the same recipe that calls for draining all but 1/4 cup of the tomato juice for a thicker sauce. Click here for that version. I love Rick Bayless! These sound fantastic! YUM i want to make these, BAD. achy has been experimenting with various combos of ground meats in her picadillo. 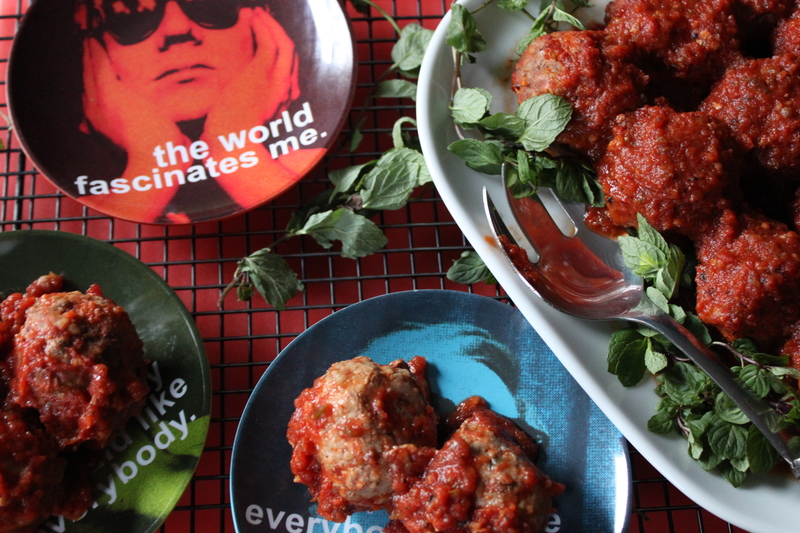 i would like to apply the same experimental principles to these meatballs (so we can make them lots!). With Christmas in Miami coming, I tried to stay away from all pork. What I really liked about these though was the mint.